Russian media fell near the bottom of the list on the 2013 Press Freedom Index. The authors of the rating, Reporters without Borders, cite President Putin’s return to power as the main catalyst in the increase of repression aimed against the opposition. Russian media personages, however, fall on both sides of the argument. In the 2013 Press Freedom Index published annually by Reporters without Borders, Russia lost six points and fell to 148th place out of 179. This rating takes into account various criteria, including the presence of censorship, the ability of the opposition to express its point of view in the media, and the number of journalists murdered or attacked. The rating’s top three places are occupied by the same three countries from 2012: Finland, Norway, and the Netherlands. The bottom three places also remain unchanged: Turkmenistan, North Korea, and Eritrea. Germany landed in 17th place, Great Britain in 29th, the United States in 37th and Italy in 57th. Last year was a highly scandalous one for the Russian media. At the publishing house Kommersant, Maksim Kovalsky, editor-in-chief of the weekly magazine Vlast, was fired for running a photograph of a voting ballot on which someone had written Putin’s name with an expletive attached. In addition, the television channel Muz-TV stopped working with one of television’s most popular hosts, protest movement leader Ksenia Sobchak. In December, the television channel STS refused to renew the contract of entertainment program host Mikhail Shatz, who had been newly elected to the Coordinating Council of the Russian opposition. 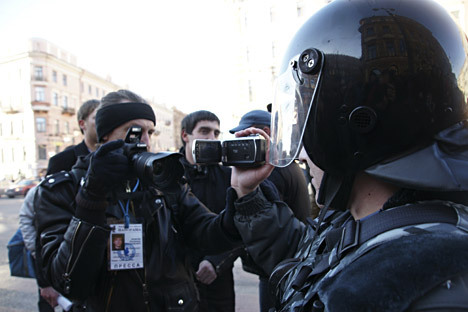 In an emergency session, the State Duma ignored protests by journalists and recriminalized defamation, which had been decriminalized only six months earlier. The Duma also discussed barring foreign journalists critical of the state of affairs in Russia from working in television. Duma deputies came up with this idea shortly after Vladimir Pozner, one of Russia’s most respected TV journalists, commented on the air on the parliamentary ban on Americans adopting Russian orphans. Pozner, who in addition to Russian citizenship holds French and American passports, referred to the State Duma as the State “Dura” (silly woman) in an apparent slip of the tongue. He later apologized for the slip, and the question of banning foreigners from working in television was dropped. Vsevolod Bogdanov, head of the Russian Union of Journalists, agreed with the assessment of his foreign colleagues. “Increased legislative activity has led to life here being seen in the eyes of the West as more and more strictly regulated: what to write, what to say. Legislators have made a big mistake in trying to limit this sphere,” said Bogdanov. On the other hand, MediaSoyuz Vice President Yelena Zelinskaya said that, in compiling this rating, its authors had approached the question from only one side: attitudes toward the press on the part of the authorities. Meanwhile, Russian society has seen “an upturn in civic activism” and the institution of online media has become considerably stronger. “As usual, the authorities would like to take measures to limit freedom, but, at the same time, there is no thought today, no fact, and no idea that cannot be expressed. For this there are a fair number of media,” said Zelinskaya. “Russia figures as a state, not as a private community… This is about the state rules of the game for the mass media. And they are only getting stricter,” said Parfyonov. Popular TV host Vladimir Solovyov, who works on the state-run channel Rossiya-1, said that he personally had not noticed any worsening or any improvement in the last few years. Based on materials from Gazeta.ru, Kommersant, RIA Novosti.